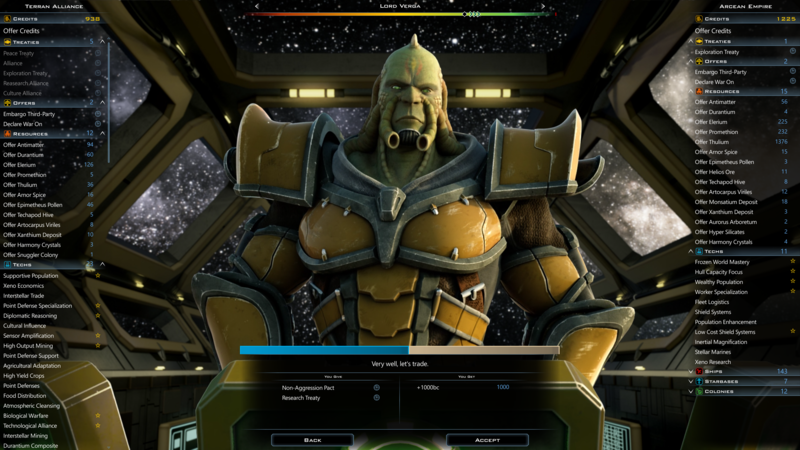 This is my random playthrough of Galactic Civilizations III: Crusade v2.5. This is my story. 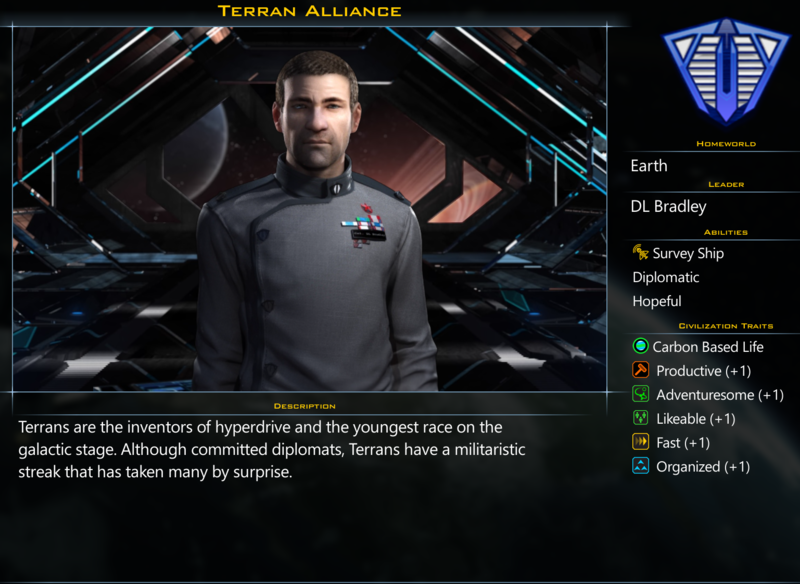 With the Drengin Empire defeated, the Terran Alliance was free to expand out into the galaxy. 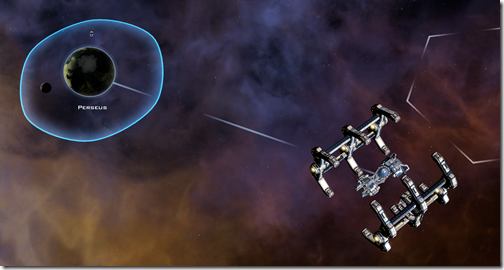 The Perseus sector was the natural next destination for the human race. 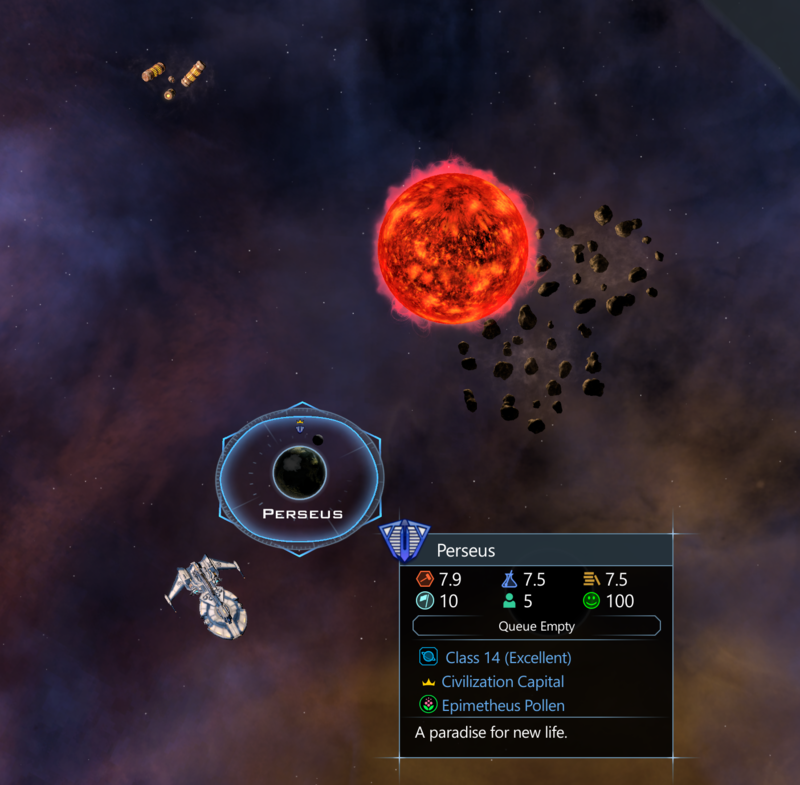 The planet Perseus was a real gem. 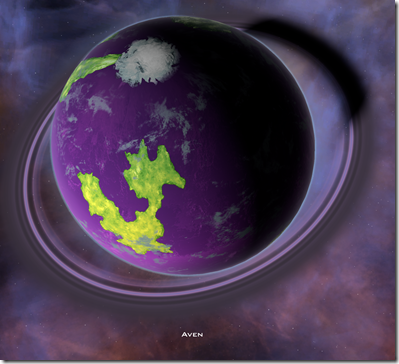 A class 14 planet meant it had a large surface, inhabitable surface area to build on. The planet had a single major continent that was the size of Asia plus three other contents that each were roughly the size of North America. The planet also had a vast forest of Epimetheus trees whose flowers are extremely valuable in trade due to their pollen which has numerous uses. The first thing we would do is construct a Shipyard which we'd use some of the wealth we brought with us to rush into service. 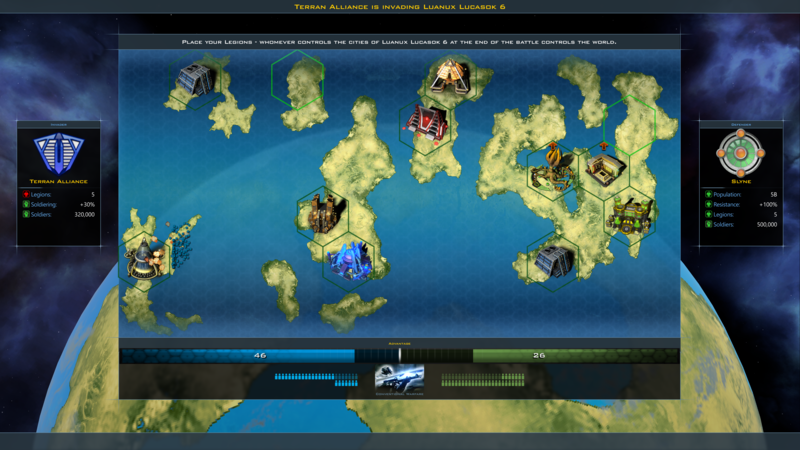 The next move was to build a space elevator in order to better supply the new shipyard. The TAS Discovery encountered some floating capsules. Clearly, something or someone had been in this area of space already. 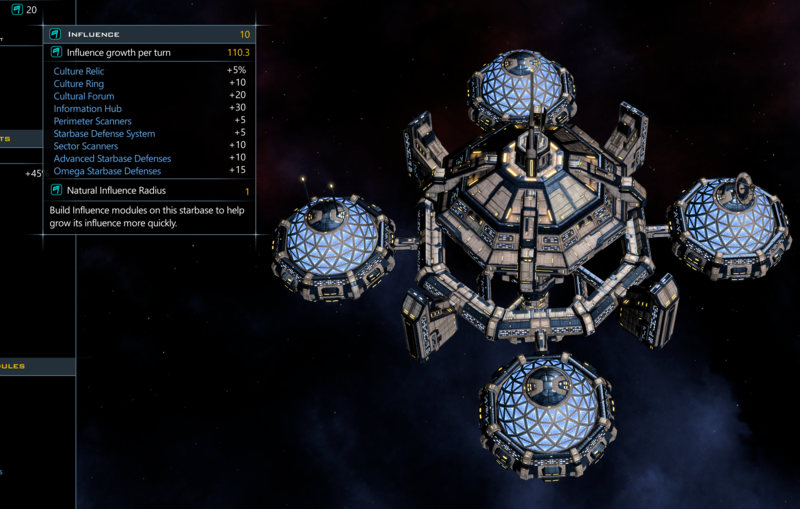 The Perseus shipyard also began constructing a Colony ship. 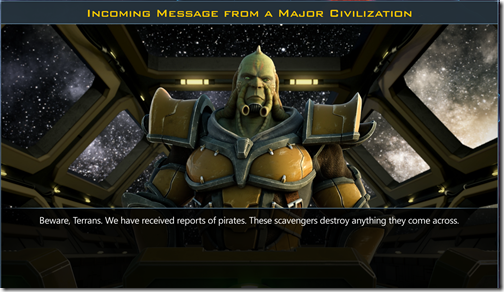 We know that the Arceans and other civilizations from the Orion sector had made it out this far. 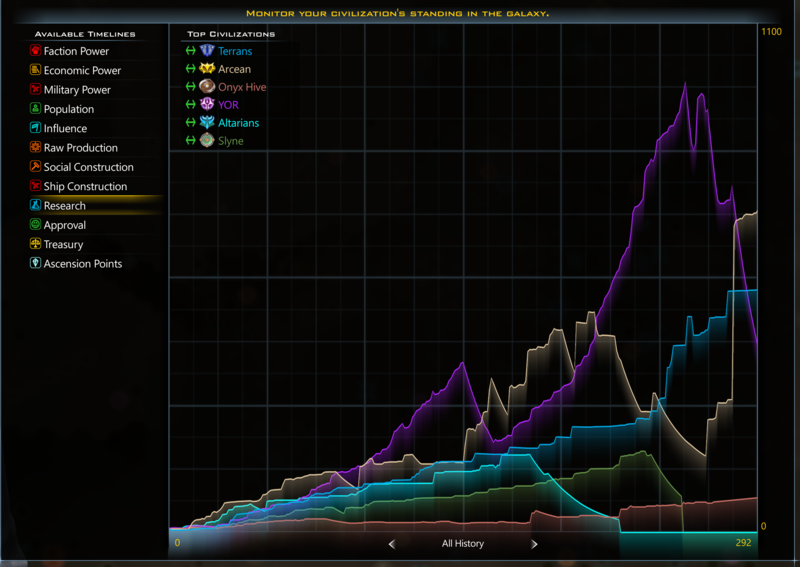 The worlds and resources of this sector were up for grabs. By the end of the year, a second planet had been found. 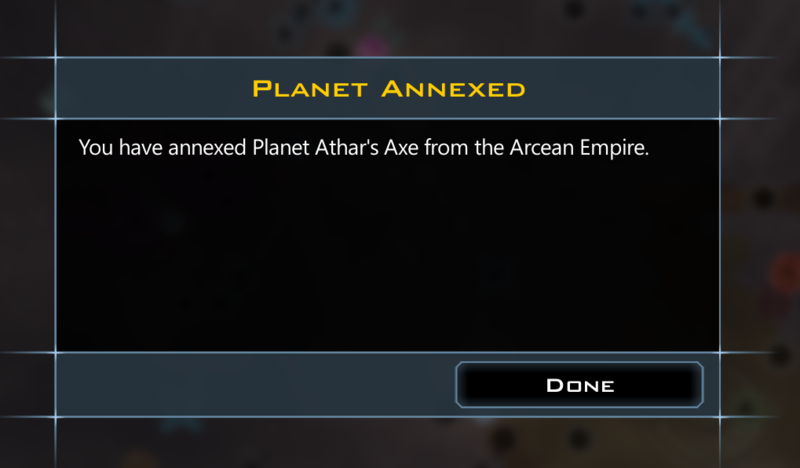 This planet contained Arnor Spice which would be very valuable later. We also finished our first starbase "Orion's Legacy" around the star Kalinar. Kalinar was only 2.1 light years from Perseus. The Arcean Empire was out here along with the Slyne. 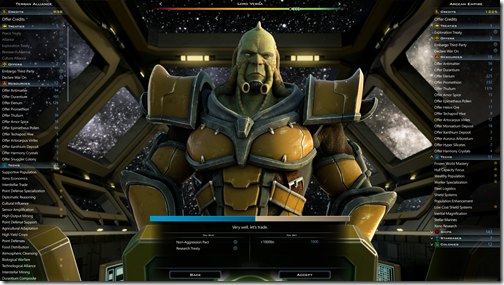 The Terran Alliance had a cordial relationship with them back in the Orion sector. 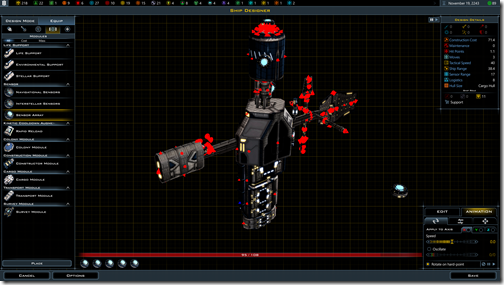 How well it works in the Perseus sector would remain to be seen. We had found all the neighbors..right? No. There is something very dangerous out here. 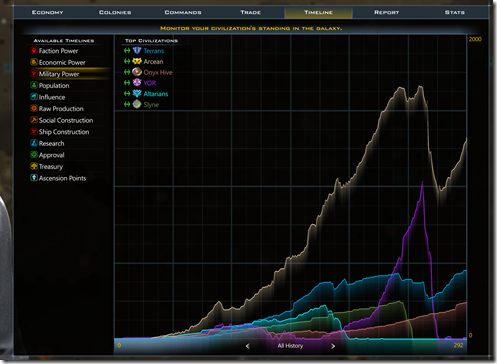 On change in v2.5 that will make things very interesting is that 1 population now equals 1 raw production. 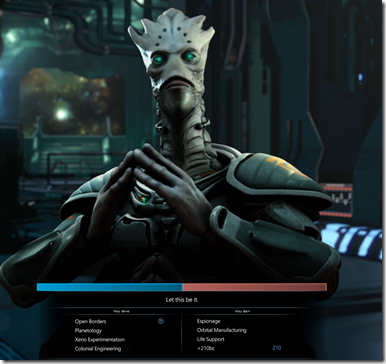 All the planetary improvements and other game elements have been rebalanced around this which will make most people happy but some people very unhappy. For example, I did the colony rush thing (lots of colony ships rushed) which means I consumed nearly all of my population which now means I consumed nearly all of my resources. 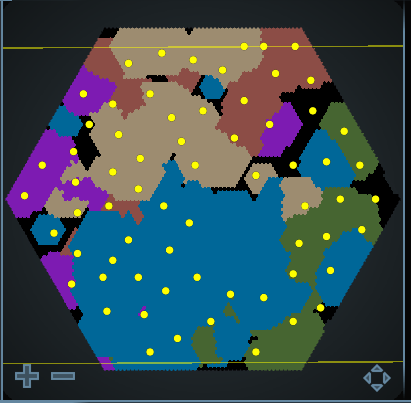 This also means that my farm world of Freegard is very important. It will be the breadbasket for the Terran Alliance. Also: Be aware that Planetary Invasion is now in the Age of Expansion instead of the Age of War. So invasions will be coming earlier. 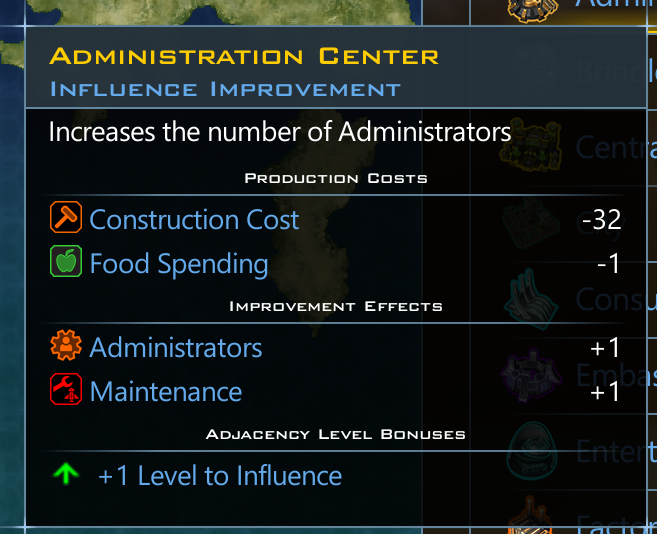 Having lots of food also allows me to build Administration Centers which consume 1 food but provide an administration point in return. The Onyx were manipulators. Best to keep on their good side. 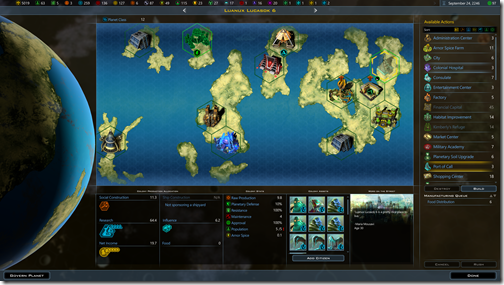 The Arceans had emerged as the most powerful civilization in the Perseus sector. It was decided we should keep an eye on them. 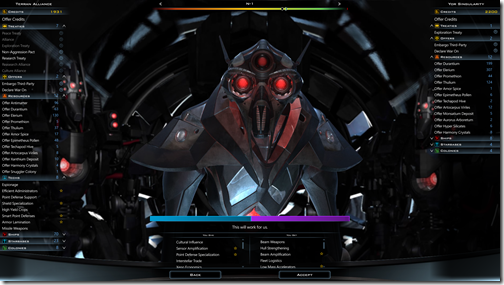 Aven began to construct the first Terran Alliance pure military vehicle, the Patroller, in order to provide some deterrence. 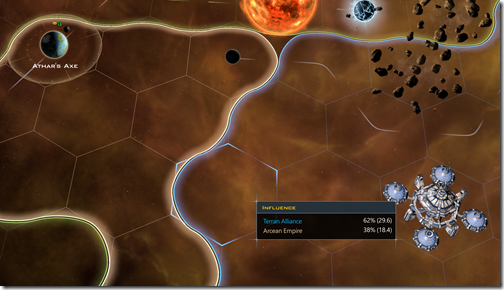 The Terran Alliance was located in the middle of many powerful neighbors. 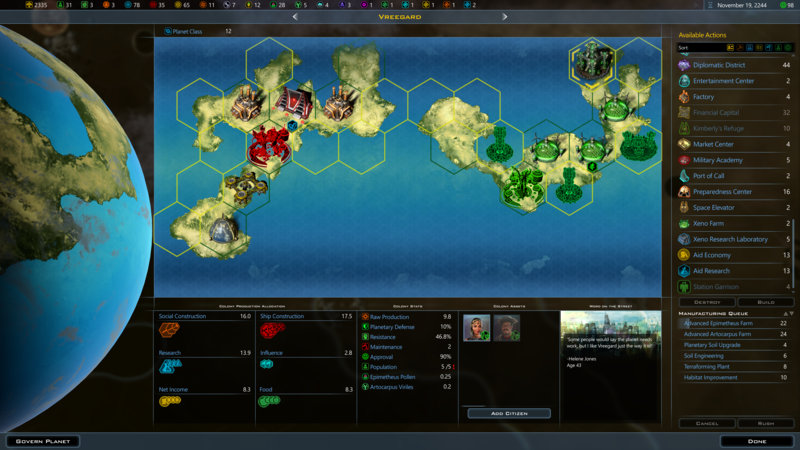 The question was, what was the right path to secure victory? 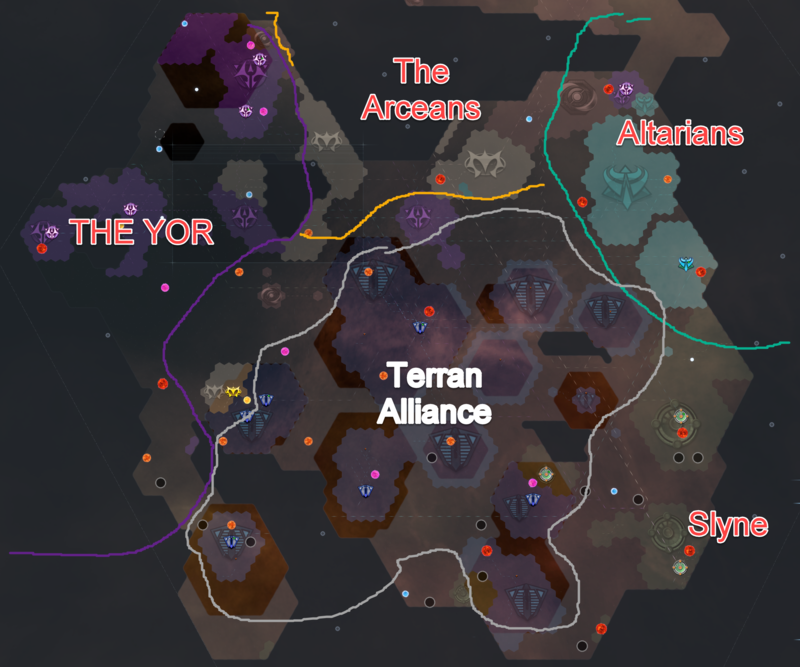 The Yor were slowly becoming the most powerful as their war with the Arcean Empire was slowly consolidating their power. 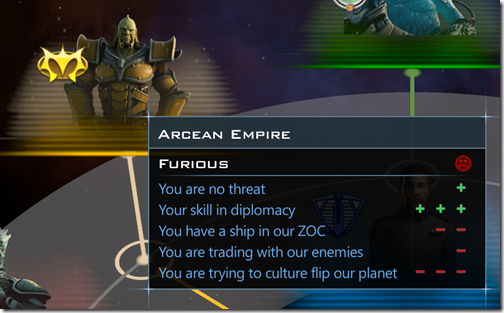 But the Arcean Military was no joke. 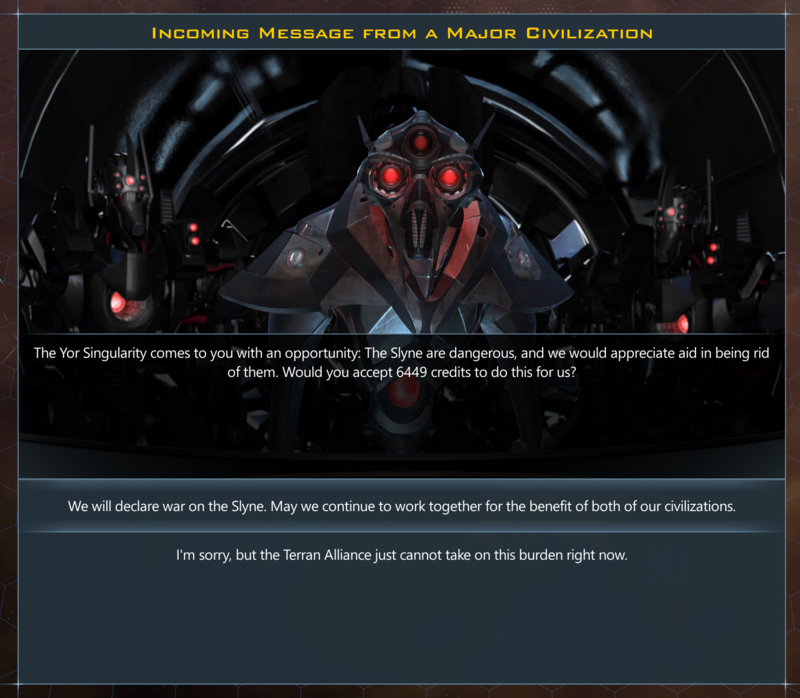 It was time for the Terran Alliance to take stock. 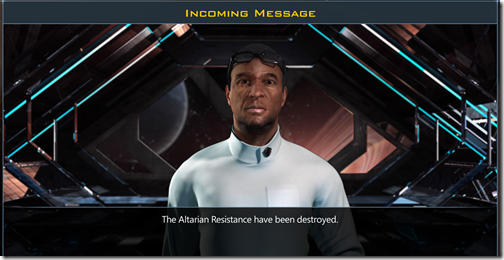 Its biggest advantage was in starbases. 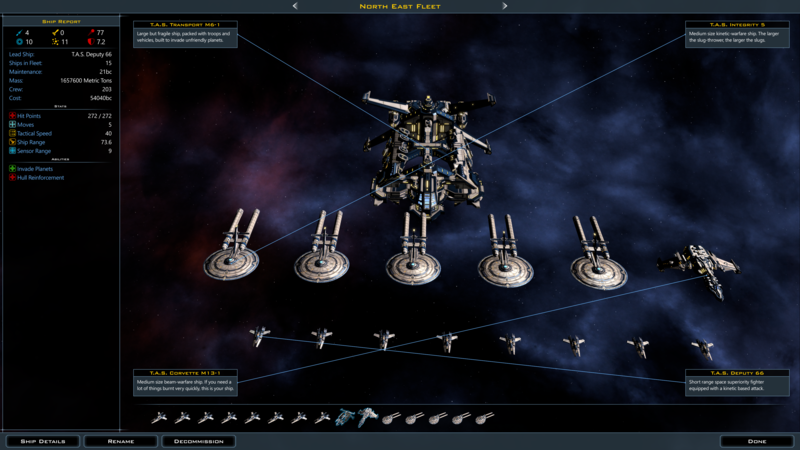 However, starbases in v2.5 weren't quite the power houses they used to be. They could be destroyed without nearly the effort it used to take. The Arceans were building their civilization up well (a major update in 2.5 btw). What we needed was more information on what the other civilizations were up to. To this end, we began to research better sensor technologies. Thus was born the Peeping Tom. Meanwhile, at home, we would attempt to win through a cultural victory. Would this work? 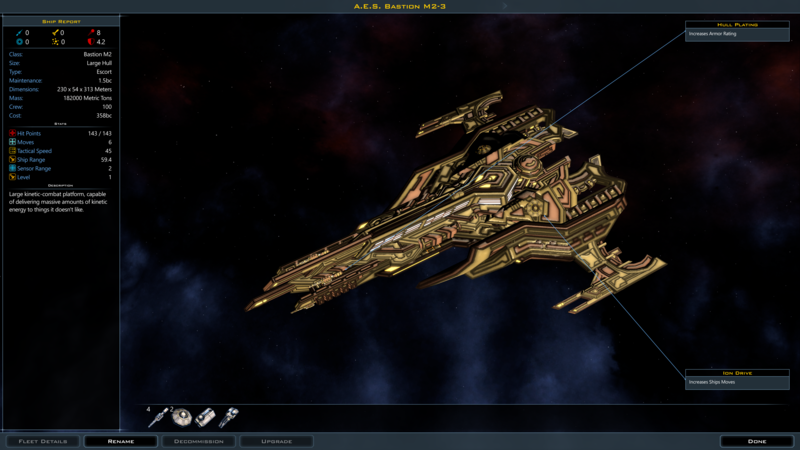 Version 2.5 heavily beefs up the cultural starbases. 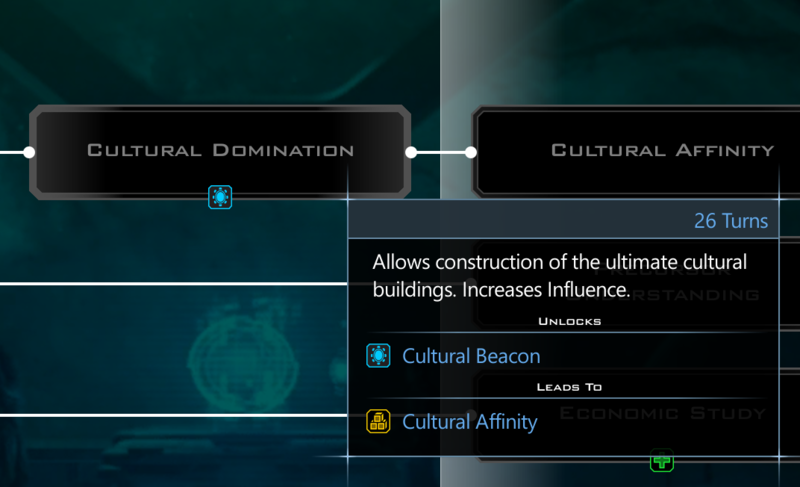 With 110 influence per turn, these Culture starbases should, ideally, persuade the citizens of other civilizations to peacefully join us. 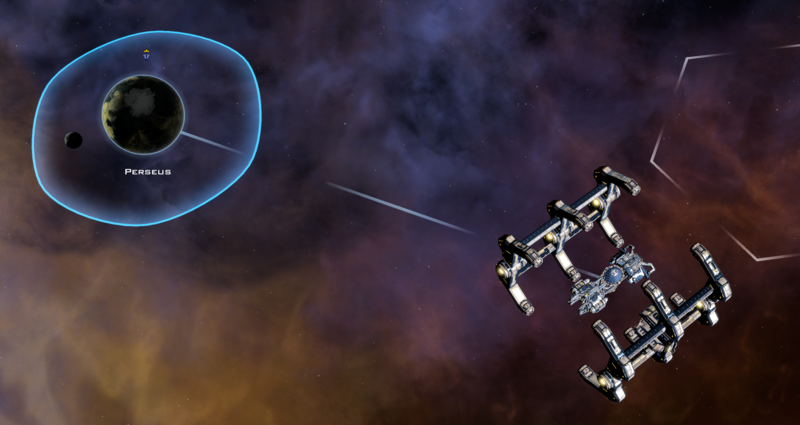 But just in case, we began constructing the Integrity class Battle frigate. 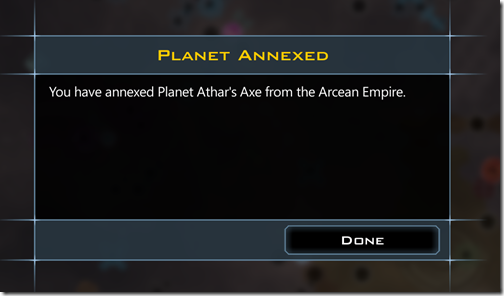 The first test would be the Arcean planet of Athar's Axe. The Arcean Empire dispatched one of their Battle Cruisers to the area as a show of force. They couldn't quite claim we were doing anything hostile but they definitely didn't appreciate what we were doing. The question was whether our diplomacy efforts would keep ahead of their annoyance. But Athar's Axe is ours. Vreegard has realized its potential. 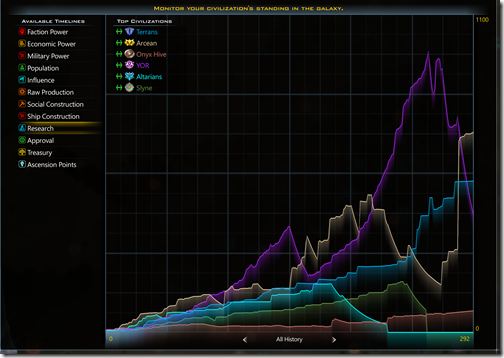 Many great cities in the Terran Alliance are fed through their efforts. The Yor had a good run. 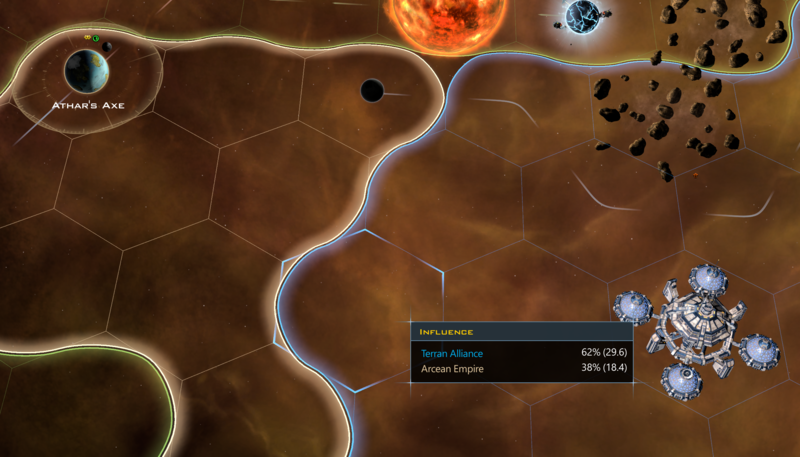 But they could not deal with the combined might of the Arcean Empire and the Altarian Republic. Something to bear in mind when you're playing is that how exciting things are depends heavily on which players you have with you. 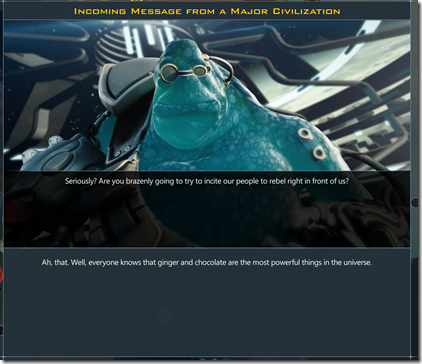 Long ago, we made the decision that civs wouldn't just go to war with you to keep things exciting. It has to be in their best interests and/or a moral imperative. Unfortunately for the Yor, the Arceans had both reasons to go after them. 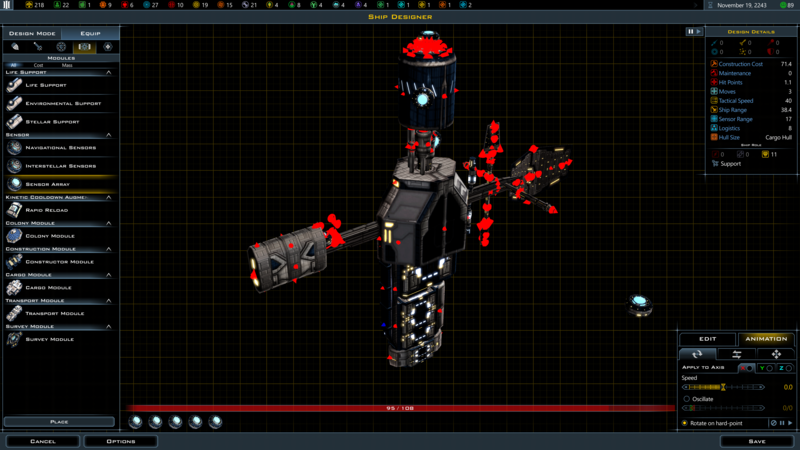 For version 2.5, the Yor got a lot of AI love which made them a lot tougher to take out. 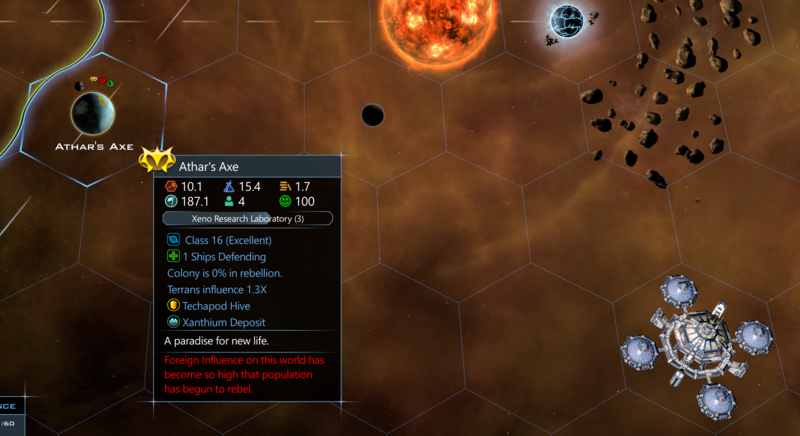 They develop their planets more effectively and their ability to increase their population is quite powerful. 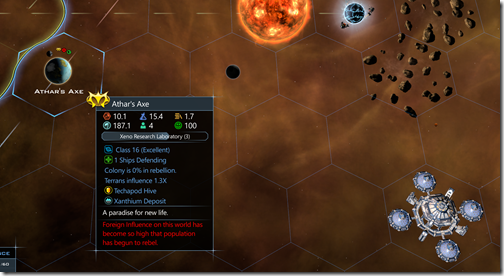 However, it now costs Durantium to produce population so if you want to wreck the Yor, keep them away from Durantium. 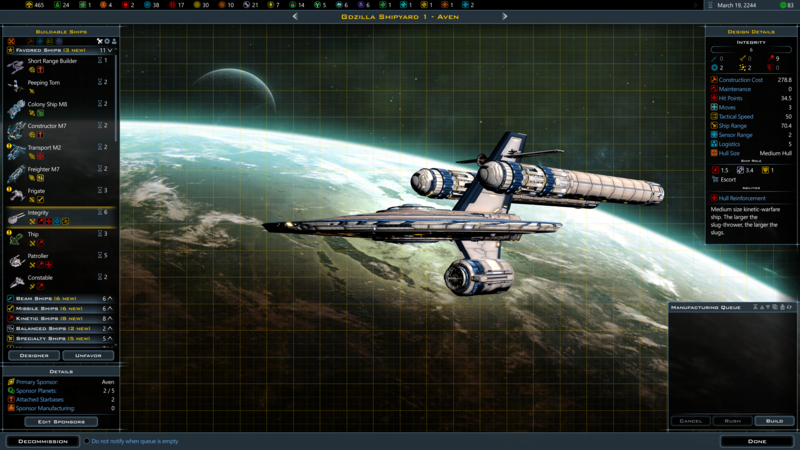 The most gratifying thing to watch was the new fleet code working. 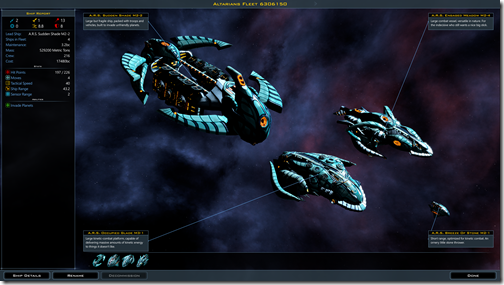 In 2.5, the AI no longer uses the built in fleet creation system (i.e. the one you guys use) because there were too many cases where it would not form the fleet (this is a complicated thing but has to do with timing -- it won't form fleets unless it is during its turn but the ships often don't get moved during what is technically its turn). 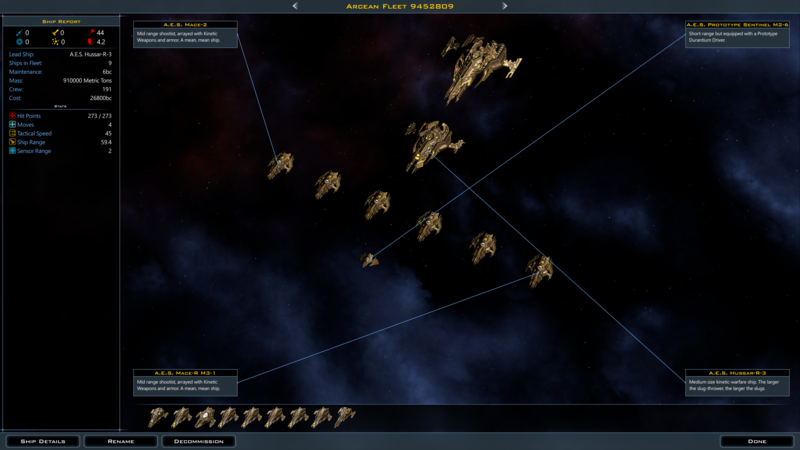 Thus, now the AI does form much bigger fleets. 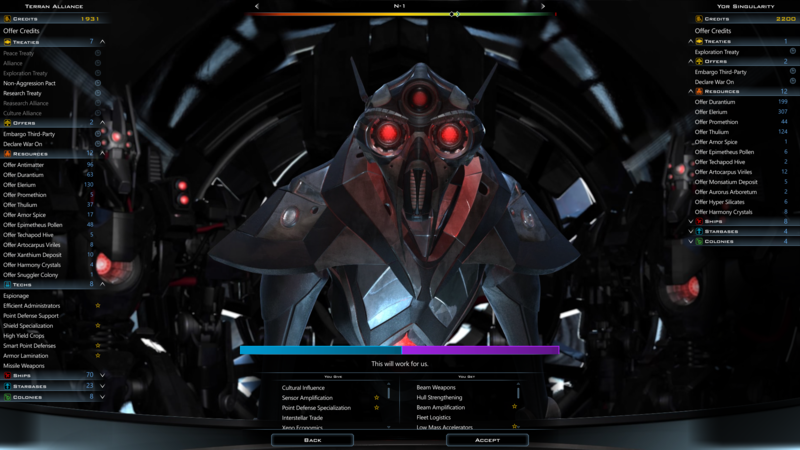 The biggest challenge in the AI here is the battle between "AI theater" and "effective war fighting". Effective war fighting means making mistakes sometimes. Taking chances. But human players are very quick to see a mistake (one they make themselves) and believe the AI is "stupid". Thus, a lot of time is spent avoiding mistakes at the cost of not taking chances. 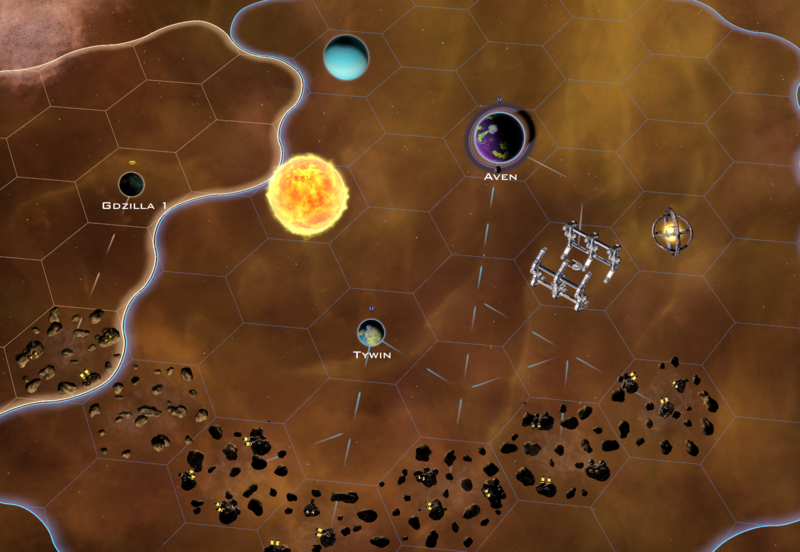 Thus, that undefended planet that is only 10 tiles away may be safe from a nearby transport only because the AI can't see the entire FOW on the way there and is afraid of being ambushed. 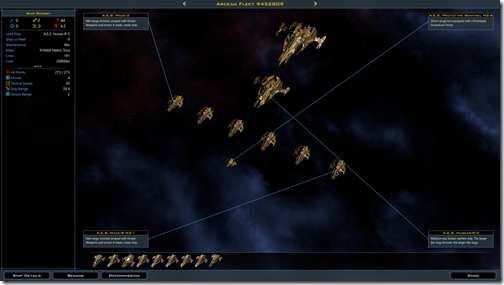 The AI handles its own fleet creation now rather than relying on the main UI. 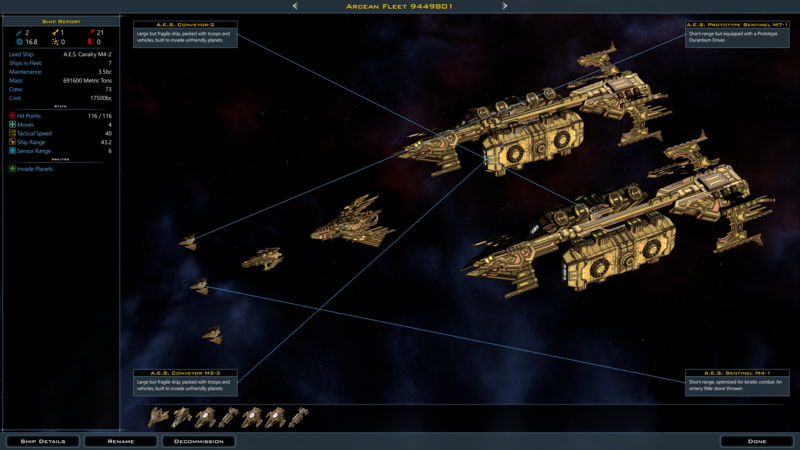 Multiple large Arcean fleets converge. 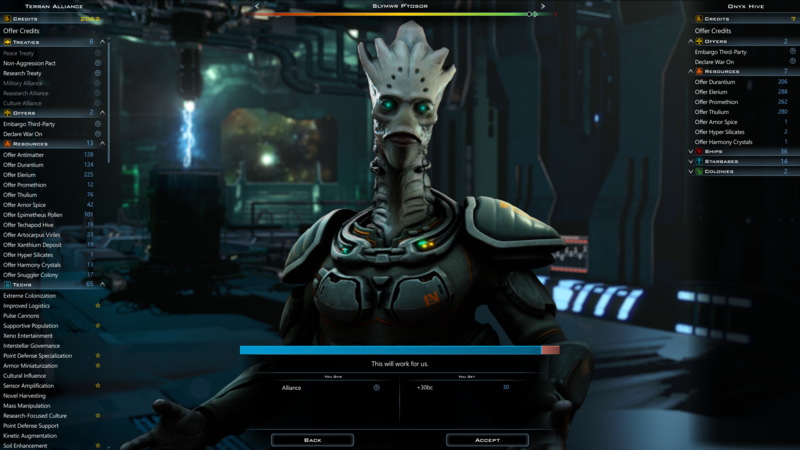 The Peeping Tom sensor ships are keeping me appraised (and letting me watch the effectiveness of the new AI). It's a little scary. 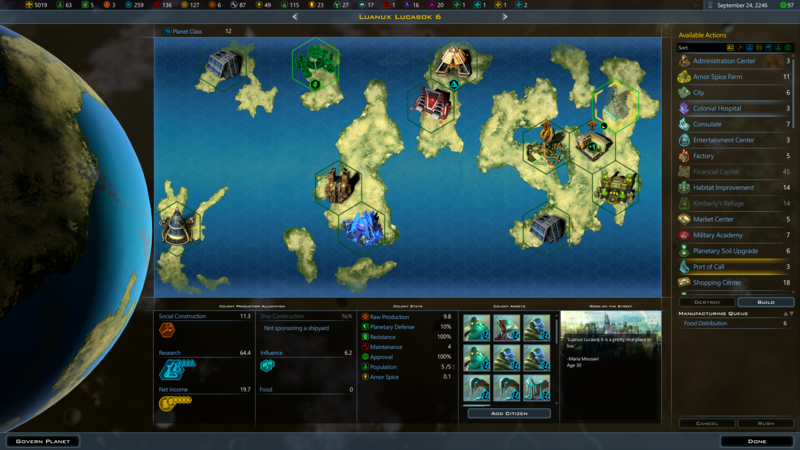 It is definitely time to build ships that will counter the Arcean Empire. 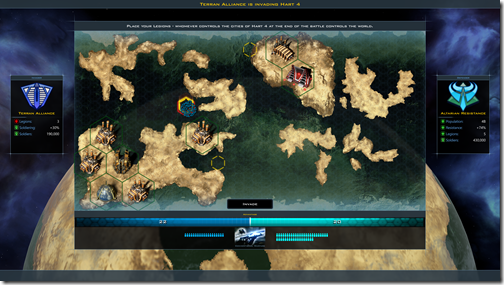 Their ships have focused on kinetic weapons and defenses. 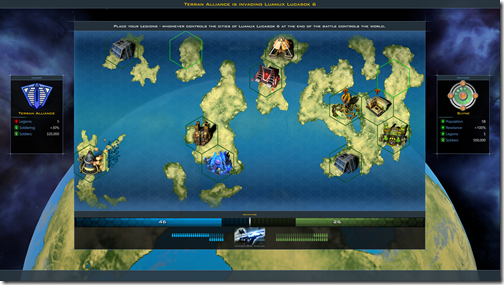 We will need to switch to armor as our defense and explosive energy (missiles) to counter them in the event of war. God's Bellow is not a pleasant place but the people love it. 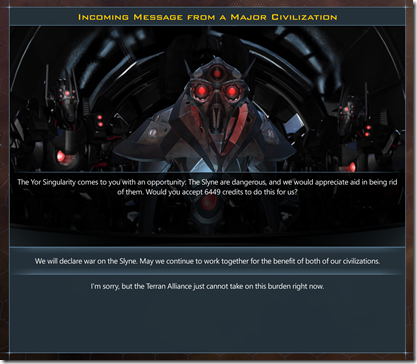 The Altarians disliekd our trade with the Yor enough to declare war. However, they were not powerful enough to be a serious threat. 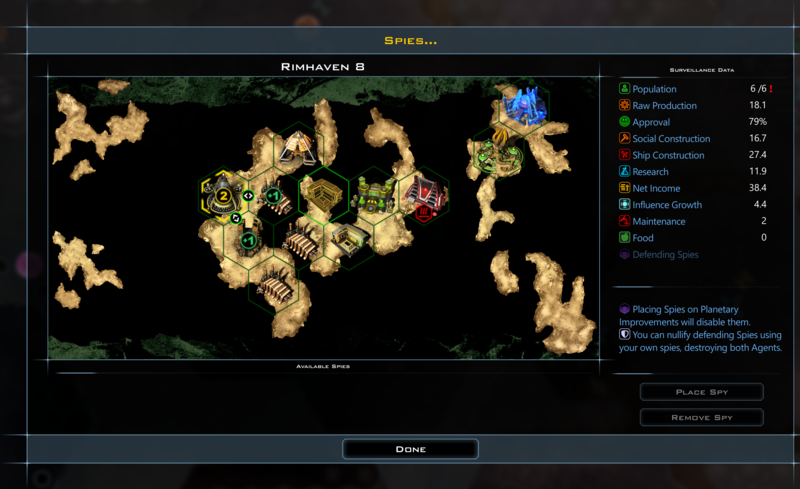 Placing multiple diplomats with the Arceans, lots of trade and a great deal of sucking up allowed us to set up a non-aggression pack while we deal with the Altarians. And that encourages them to go after the Altarians as well. The Altarians have much better ships than us. Their hull technology is well beyond ours. The most massive trade I think I've ever done. What we lack in technology we make up in quantity. The humans die in large numbers to the relatively small Altarian forces whose weapons seem strange and bizarre to us. No. 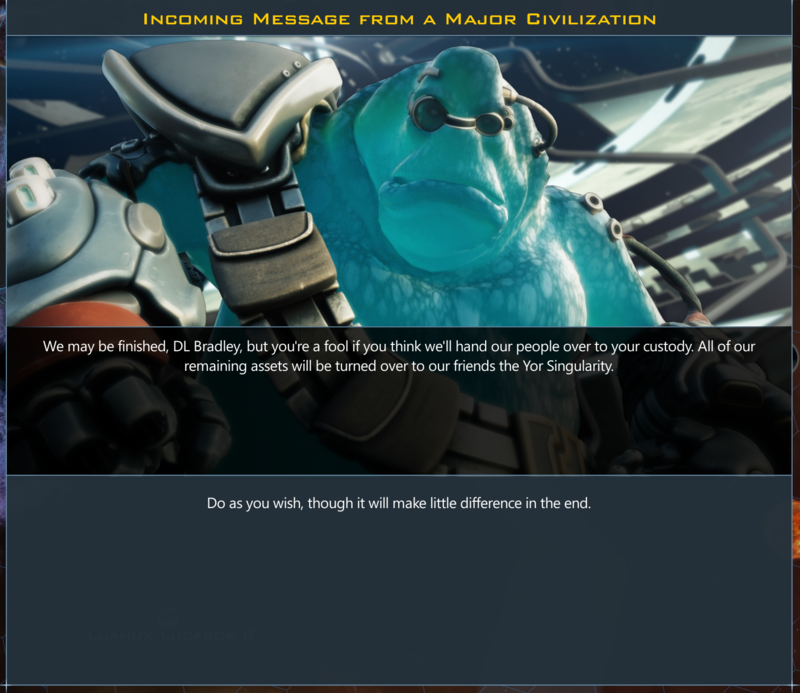 You're going to die. Brazen...is such a strong word. 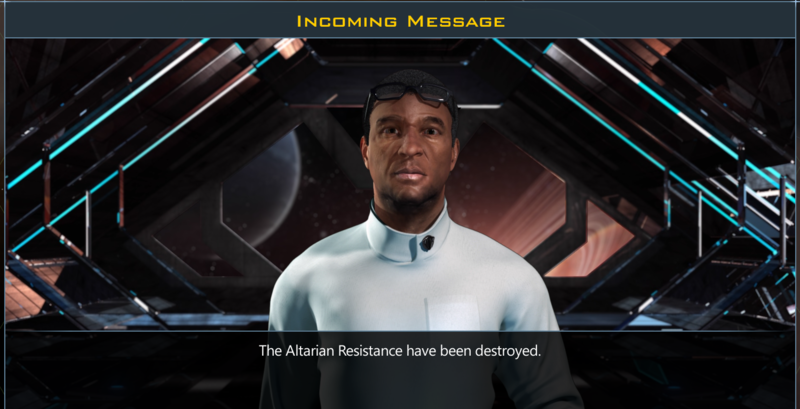 The Altarians are going to die. After much research, the Yorktown class Battle Frigate arrives. A technologically superior ship to anything the Arceans have in the event of war and can fight toe to toe with the Altarians. 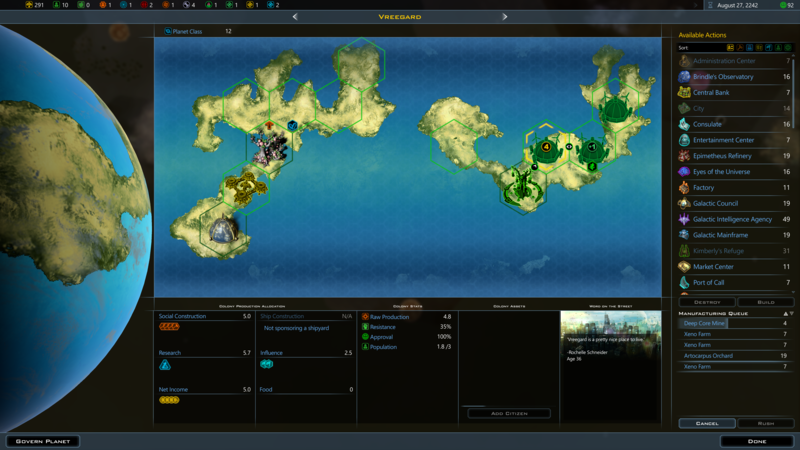 This quadrant of the sector would be garrisoned by the North East fleet. 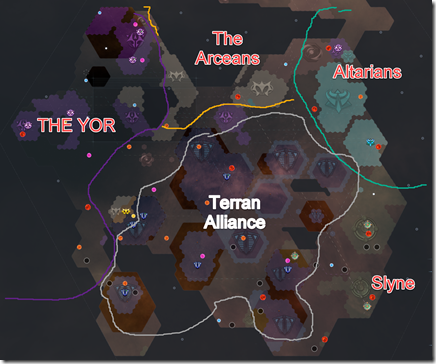 After 229 weeks the Perseus sector is split between the Arceans and the Terrance Alliance. 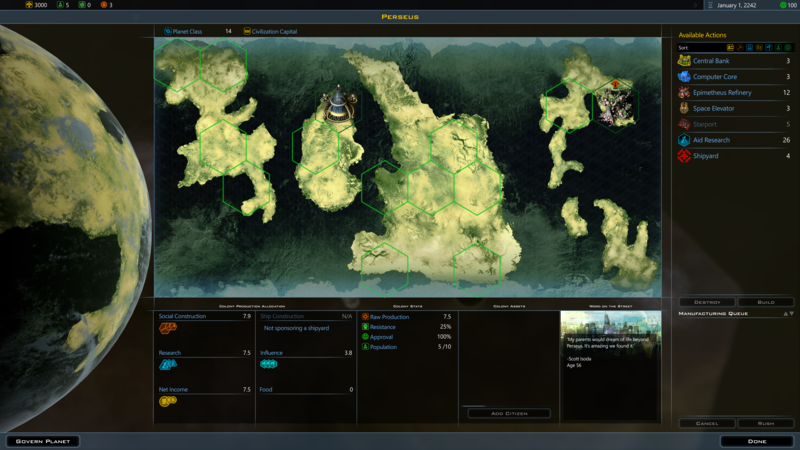 The cultural strategy has resulted in the Terrans controlling a much bigger area. 3060 parsecs (tiles) are now controlled, nearly double of the Arcean Empire. 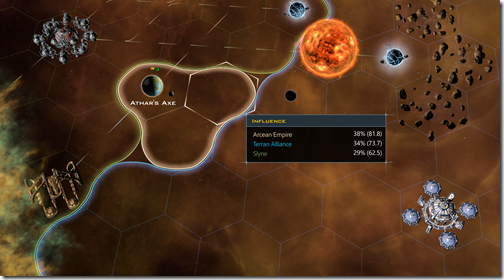 The Arceans and the Terran Alliance renew their alliance. As well as the Onyx. The Human / Slyne war was not all that dramatic. The Slyne never had a chance. 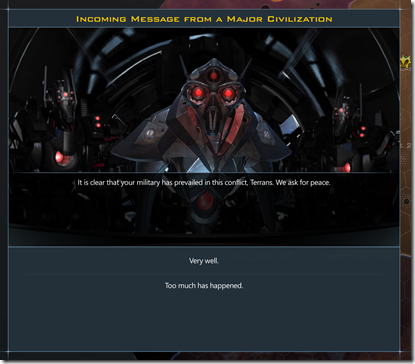 But their improved fleet handling allowed them to finally take out those culture starbases that had been annoying them. 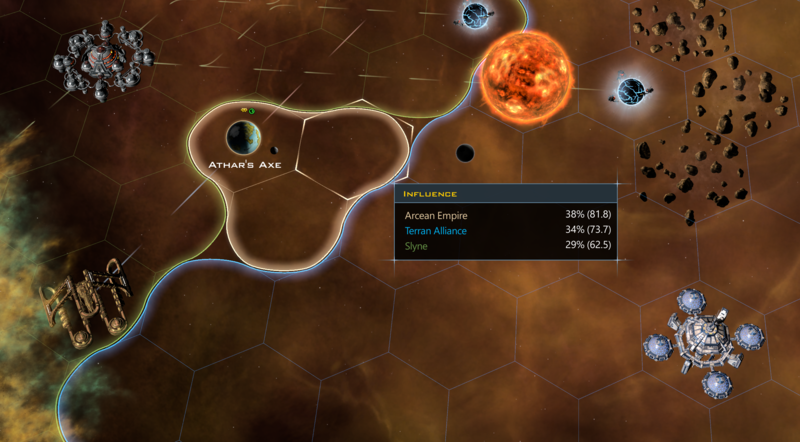 But once the Arcean Empire was involved, their doom was swift. 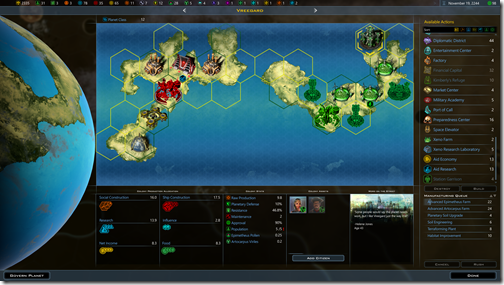 Dozens of large fleets obliterated the Slyne civilization like a swarm of locust. The Yorktown made its debut appearance. 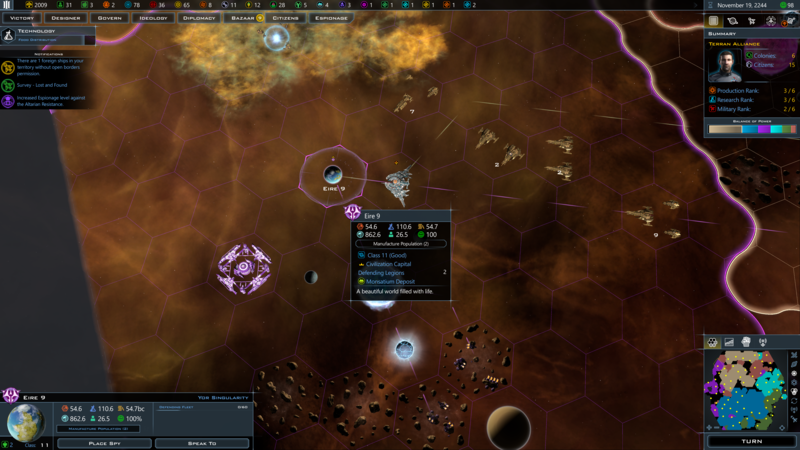 Unfortunately, it couldn't fight off an entire fleet on its own. 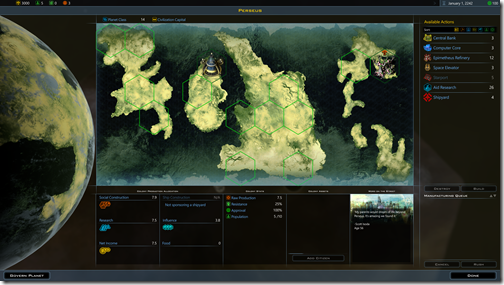 But the Arceans followed up and took out the defenses of their planet allowing for our invasion force to move in. 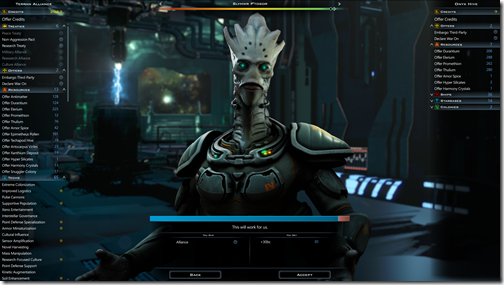 The Slyne science council was still on the planet! They would now work for the human race! Sore losers to the last. With the Slyne gone, only the Yor were left. 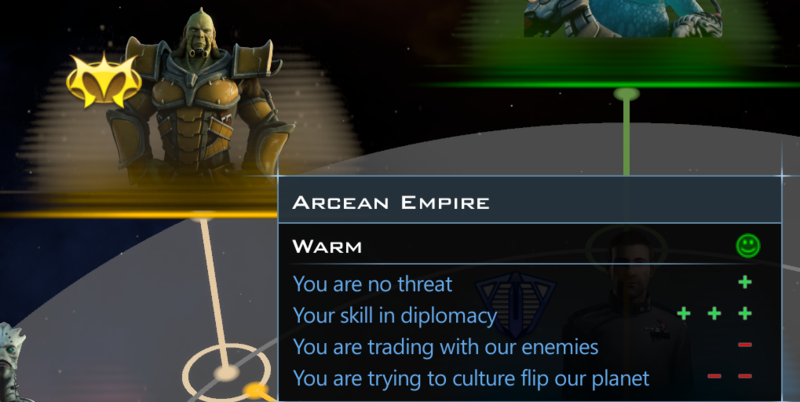 Let the Arceans deal with them. What was scary about the Yor war was that without the Arceans, I'm pretty sure they would have destroyed me. 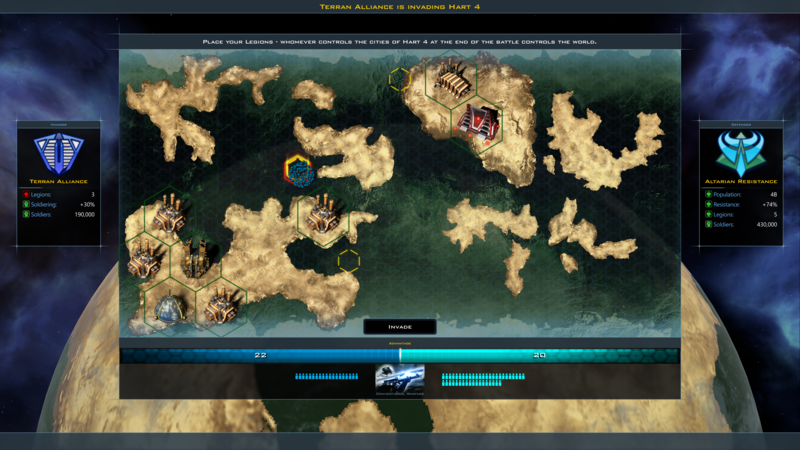 A victory through an alliance between the Arceans, Terran Alliance and Onyx. Total play time, 5 hours and 11 minutes. The Yor were incredibly powerful but ultimately could not deal with an allied assault. You can see exactly when we captured the Slyne science council in the graph. When I off-handedly decided to take out the Yor, I didn't realize how powerful they had gotten. Only the combined efforts of the Arceans and Terrans took them out. 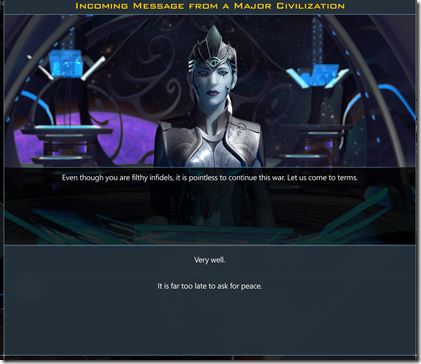 Just to clarify, how were the starbases debuffed, so they aren´t "quite the power houses they used to be"? 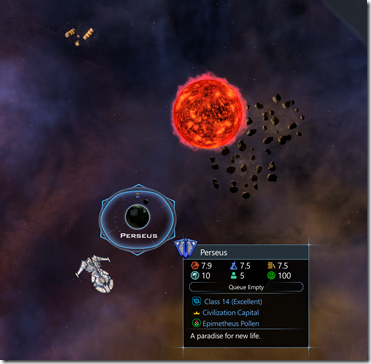 Starbases debuffed? Thats a shame. It was nice that they weren't such push overs. Really exciting to see my Integrity and Yorktown classes I created for game used to demonstrate game play for v.2.5 for the Terran Alliance. I hope to see more Dev's using my creations. Thanks for the Demo!!! 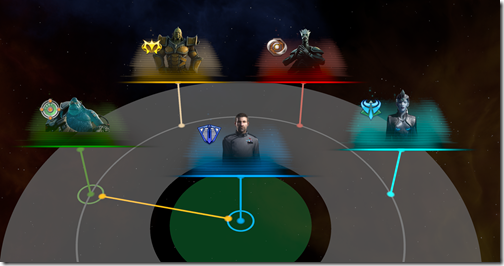 In the current Crusade 2.33 starbases only have 50 hit points. I think they used to be 200. That might (or might not) be what Brad is referring to. They are pretty easy to kill now. 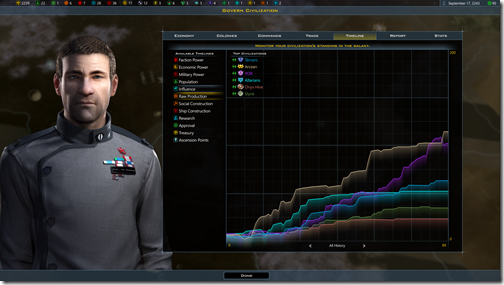 I'm attacking with fleets that would have suffered medium to major damage in earlier versions, and now they are only taking minor damage. 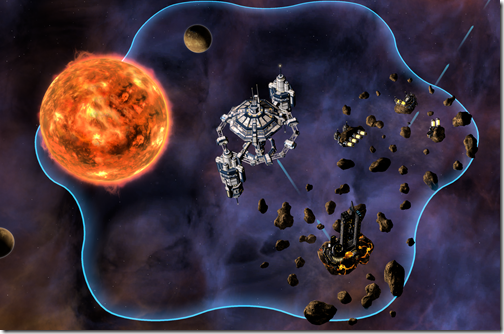 The star base is only able to get off one or maybe two attacks before it is overwhelmed. 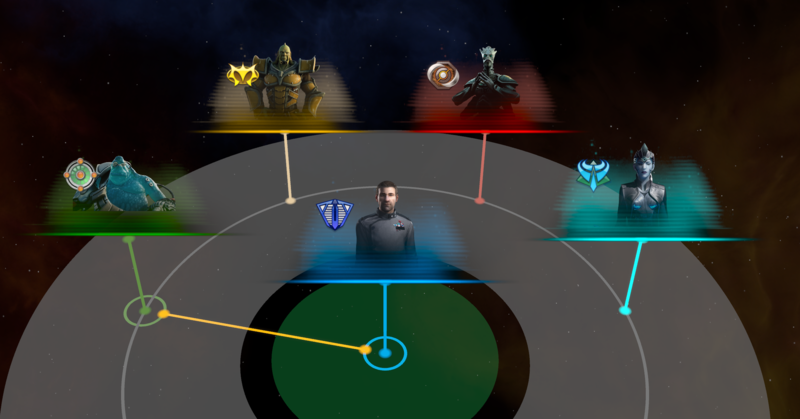 In the current Crusade 2.33 starbases only have 50 hit points. I think they used to be 200. They do get taken out pretty easily. 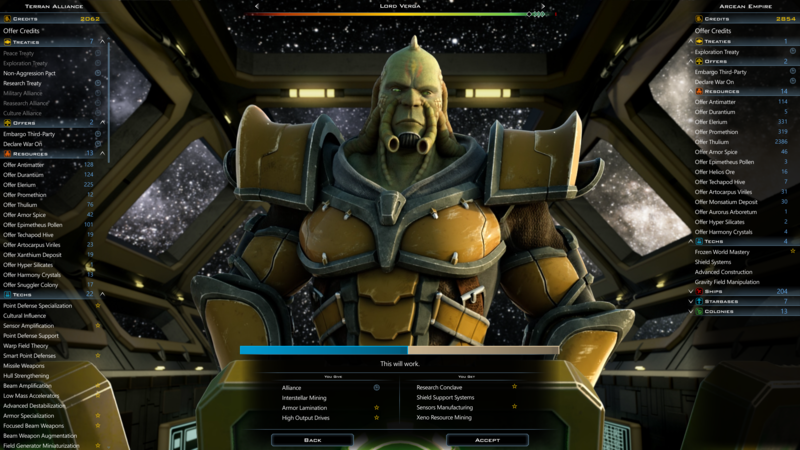 Having a lot of defenses and weaponry on them seems to work to dissuade the AI from attacking them, less than they do starbases with little to no defenses, but once they do attack them the outcome is mostly a foregone conclusion. 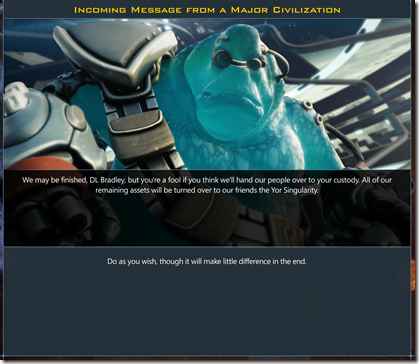 Chmmm... That sounds rather debilitating, turtling with starbases should be a viable strategy. 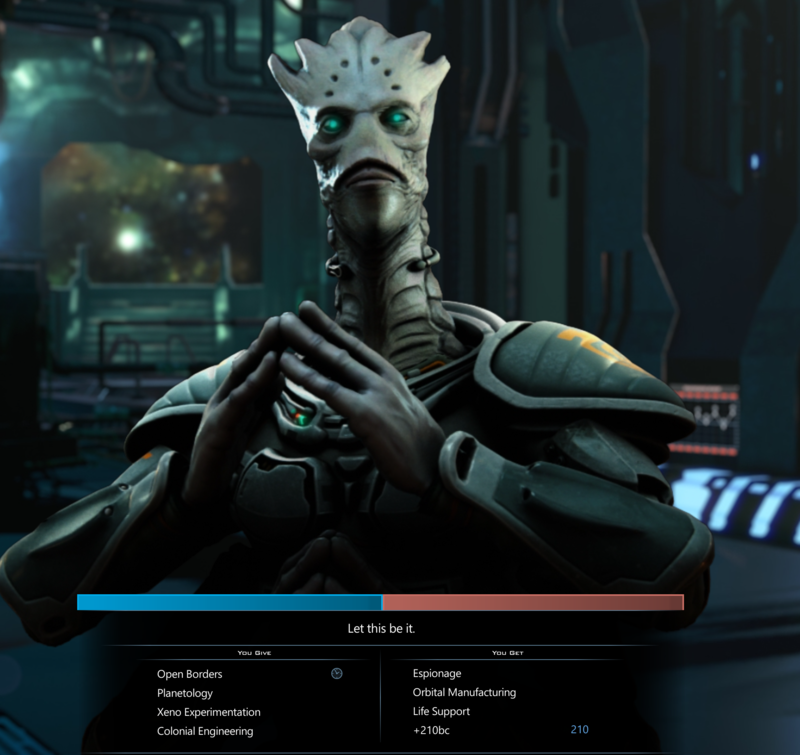 @Frogboy: are you considering some other starbases revamp in the near term? 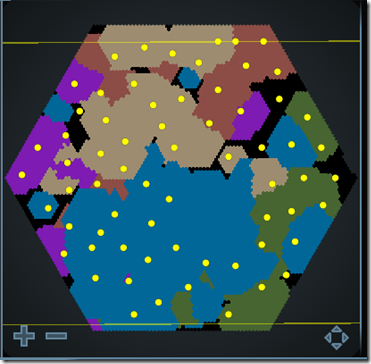 Then put defenses on your starbases. They shouldn't be unbeatable for free. The SB defenses are outpaced by the ship upgrades; especially when you consider the SB defenses are passive only--you can't move SB's, you can only wait to be attacked. You're better off guarding SB's with ships. Which I actually thought was part of the game design--make it more offensive style. Actually I'd like to see military SB's come into play more. 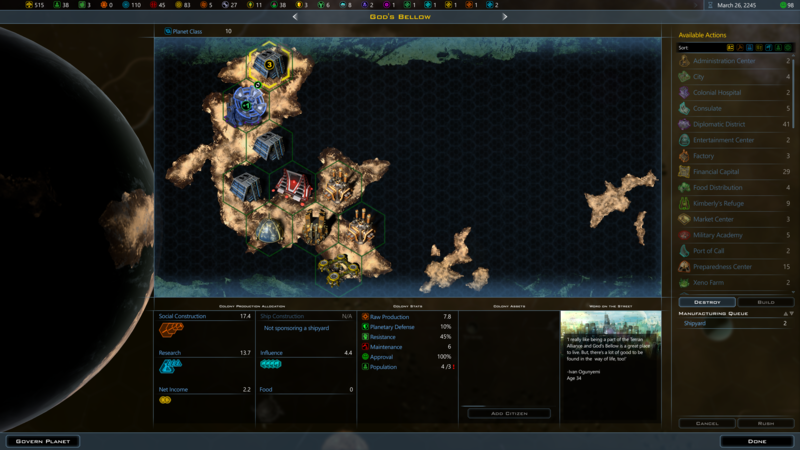 But it's the same problem: SB's don't move, ships do, and you're spending an admin point for something that can't move. 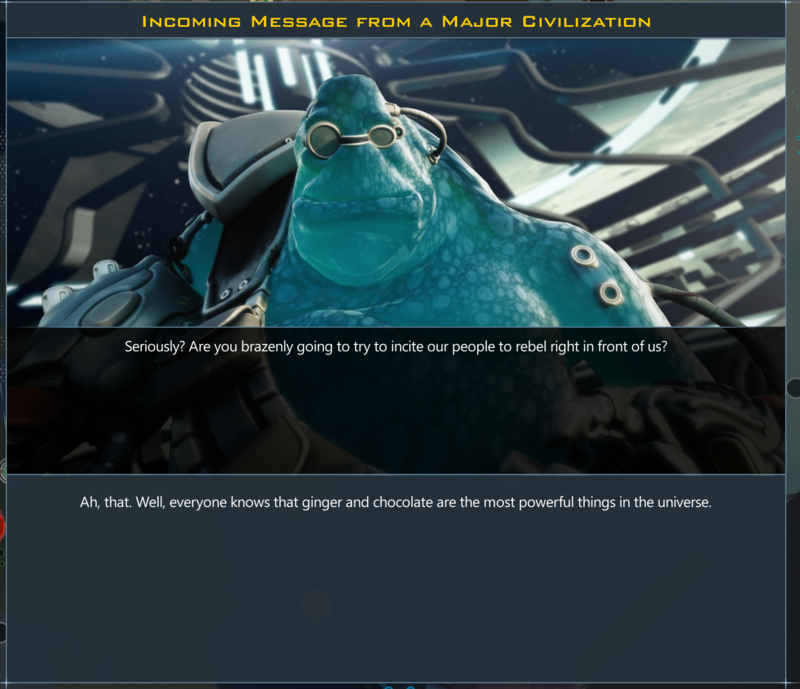 At that point, you should probably station ships there. Actually I'd like to see military SB's come into play more. But it's the same problem: SB's don't move, ships do, and you're spending an admin point for something that can't move. 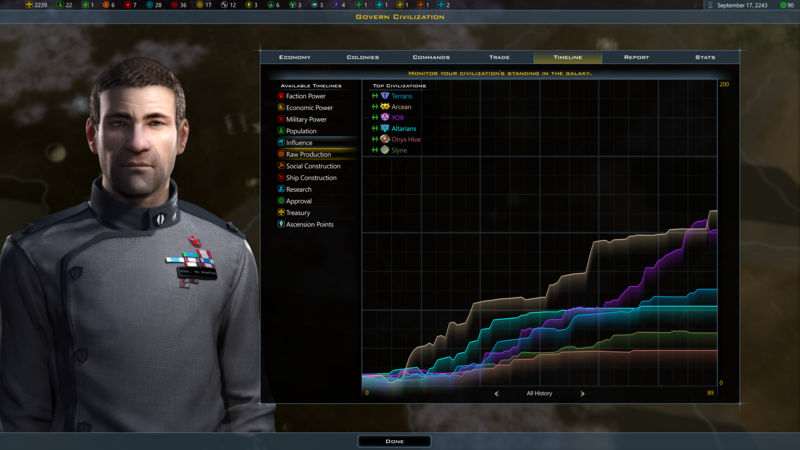 I think the military Starbases are really a waste. 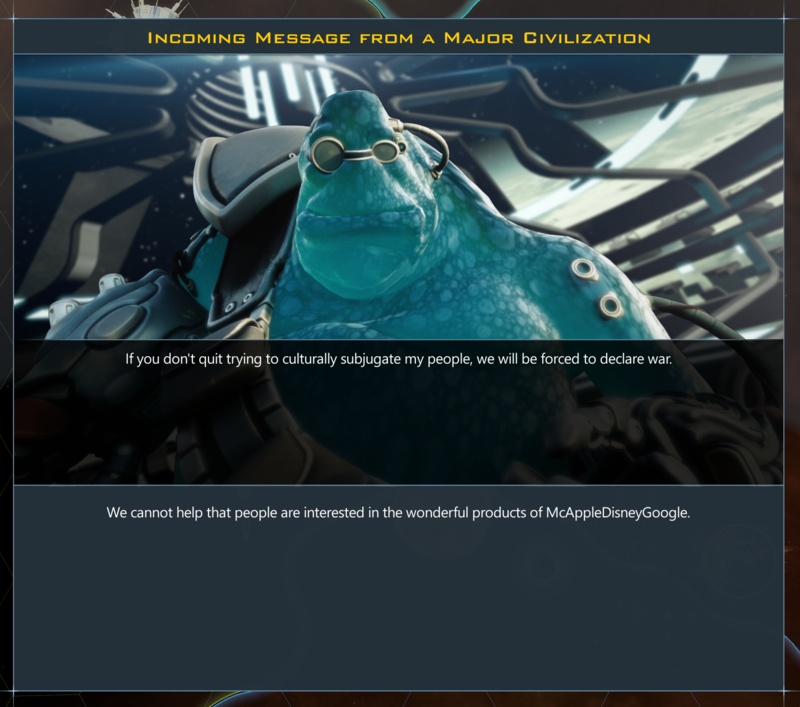 I just can't see myself wasting an administrator on one rather than colonizing a planet or building an economic, mining or cultural starbase. 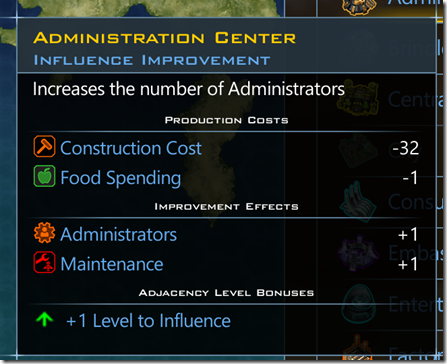 1: Not cost an administrator, which seems a little too overpowered to me. 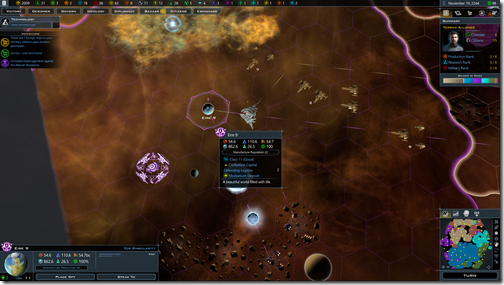 2: Have a substantially larger area of effect than other starbases. This seems like the best option since the whole point of these things is to boost your fleets so maxing their area of effect is really important. 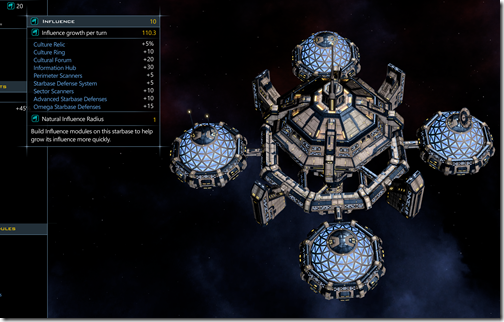 Maybe if they had some extra upgrades for extended range that only military starbases can get like two tech levels each of which adds module that adds +2 to military starbase range. 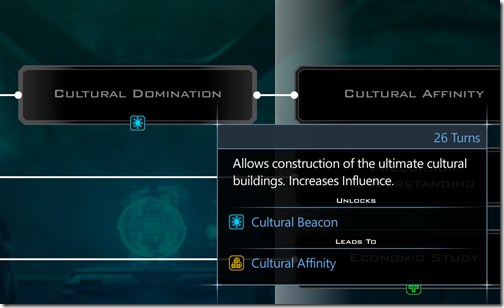 PS: Can we get some morale boosting modules for economic or cultural starbases back? 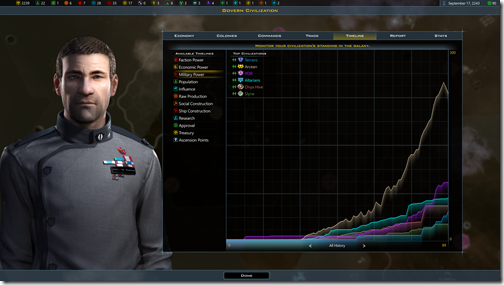 I really liked being able to boost morale by building an orbital resort so I didn't have to waste a terrain tile on a morale building. Thanks for answer. I tend to think that turtling with starbases without building tons of ships is a viable and relevant strategy the game should enable. Can we agree on that? - area-denying effects for (military) starbases - like module that prevents invading worlds in the are of effect (increases defense), substantial speed, attack, defense lowering components etc. Do you think we have these currently? 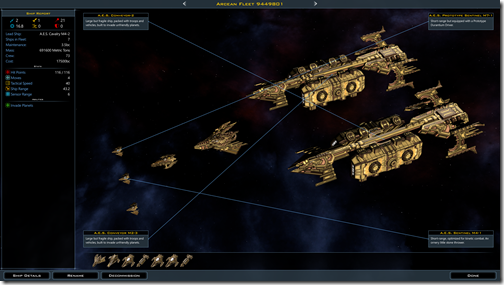 At the same strategic availability as similar improvements for the ships? 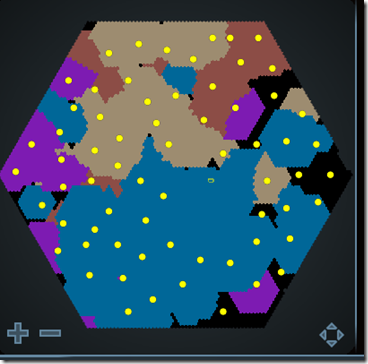 I believe they should get real buff AND wholly new functions (like area/invasion denying). 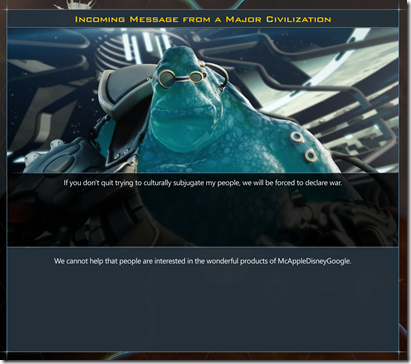 Maybe you could station your legions to a military starbase instead of to a planet and then they could defend any planet within its area of effect.